Learn about adopting a pet through the KAAP website. Adopting a new pet is a big responsibility. We want to help you make the best decisions for you and your new pet. Lost your pet, or found one? Search here! To post a lost or found pet on this site please fill out the form on the post a pet page. Looking for your perfect pet? We have cats, dogs, kittens and puppies, and others, currently waiting for forever homes. Kootenay Animal Assistance Program Society (KAAP) was founded to meet the needs of homeless and disadvantaged pets who might otherwise fall between the cracks in existing services. KAAP is a registered charity serving the West Kootenay in BC. We are 100% volunteer, and are no-kill. Help us save lives! Volunteer, Donate, Adopt, Refer, and Support KAAP. All KAAP animals available for adoption can be visited in their foster homes. Please call the contact number at the bottom of each pet listing to make arrangements. Browse the listings of adoptable animals. These include KAAP animals, Private Adoptions and pets from other Rescue Organizations. If you want to adopt a pet from KAAP you will have to pay an adoption fee and fill out an adoption application. If you want to adopt one of the other animals listed here you will have to follow the instructions in the individual postings. 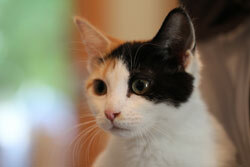 KAAP.ca is a free public web site for pet adoptions and lost-and-found pets. We currently serve the area in and around Nelson, British Columbia, Canada. If you wish to post an ad, please submit the form on the post a pet page. Be sure to include a complete description of the animal - name, age, breed, personality, does it get along with other dogs/cats/children, special needs, reason for advertising, where the animal is currently, and your phone and email information. (Please note: we do not allow post ads for animals for sale.). Once you submit the form a moderator will review the posting and publish it live to the site. For the price of one fancy cup of coffee per month, join the KAAP rescue team and have a significant impact on the future of homeless and disadvantaged cats and dogs in our communities. Hello there, I thought I would send you a little update on the dog I adopted almost 1 1/2 years ago. She was from the group of puppies named after candy and was known as “Skittles,” the lone girl in the group of boy pups. Gosh, not a November goes by that I don't think of you both and silently extend my gratitude to you both for uniting us with Miss Tyra. Willie is a very old dog who was found wandering alone, hungry, and in pain, on the Taghum bridge in early March of 2012. He initially went to the SPCA, however he needed major dental surgery and lots of TLC, so KAAP decided to take him in. Is your pet on the run? The KAAP PET ID TAG ENGRAVING MACHINE is now located at NELSON FARMERS SUPPLY. Every tag purchased is a donation to help homeless animals in our community. Protect your pet and help others! Why KAAP needs your help! Help us save lives! We urgently need foster homes right now. Call 250-551-1053 for information. Hello Tom followers.......just thought I'd give everyone an update on how our new family member is doing. He is eating very well and using the litter box regularly. He seems to enjoy being cozy in his new bed. He sleeps A LOT.